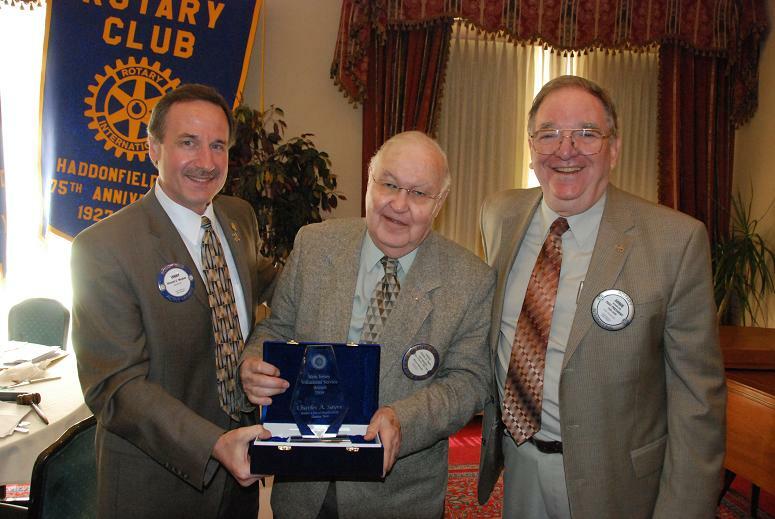 Pictured from left are: Vince Mayher, President of the Rotary Club of Haddonfield; Dr. Charles Sayre; and Club Vice President Arnold Olt. The Rev. Dr. Charles A. Sayre has been honored with the Rotary District 7640 Vocational Service Award 2009 for Outstanding Vocational Service, in recognition of the significant contributions he has made to the health and welfare of the children and youth of the City of Camden, one of the most distressed communities in the country. Dr. Sayre has been a member of Rotary International since 1953, and a member of the Rotary Club of Haddonfield since 1965. He served as its president in 1983-84. He was nominated by the Haddonfield Club for his commitment to Rotary's vision of "service above self." He served as senior minister for the Haddonfield United Methodist Church from 1965 until his retirement in 1990. During his early years at that church, he became aware of the desperate needs of families in Camden. To help address those needs he mobilized the members of his church and other churches in the region to support churches in Camden. Together they formed Respond, Inc., a non-profit organization that sought, initially, to provide proper childcare in Camden for children of working parents. He remains a board member of that organization to this day. Since 1991 Dr. Sayre has been chairman of the board of the State Street Housing Corporation in Camden, created to meet the urgent need of low-to-moderate-income inner-city families for decent, safe and affordable housing. State Street has provided more than 325 Camden residents with rental housing. In addition, the organization has rehabilitated more than 100 houses, with the ultimate goal of selling them to residents of Camden and surrounding areas. In conjunction with St. Joseph's Carpenter Society and other housing providers in the city, State Street Housing Corporation runs a 12-week home-ownership program that includes sessions on purchasing a home, family budgeting, saving and credit, financial planning, mortgage and settlement issues, home repair, maintenance, fire protection and evaluation of home-repair contractors. Dr. Sayre has been vice chairman since 1991 of Fellowship House, which has served for over 40 years as an oasis of hope, providing every kind of human service. He initiated an after-school program that provides a safe and secure home-away-from-home for numerous inner-city children. With help from members of the Interact Club at Haddonfield Memorial High School, the program has expanded from mere child care to help with homework, guidance, and mentoring. He has partnered with hotel management and unions in Atlantic City to lead efforts to provide culinary arts training for the youth of Camden. He recently enlisted Holman Enterprises and Campbell's Soup to provide training facilities that would enable Camden youth to become auto mechanics. Next in line: training opportunities in the maintenance field. He has also spearheaded a winter clothing drive which has brought more than 10,000 warm coats, hats, gloves, and scarves to homeless and needy residents of Camden.